Life with Giggles: National Ladies Day Out! Meet-Up in NJ! I saw this post over at You're my favorite today, who is HILARIOUS so if you aren't following her then do that now, and just had to share! 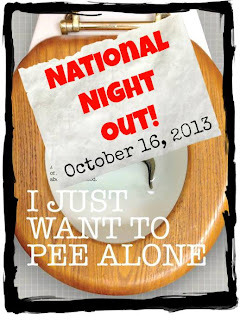 On Wednesday, October 16 at locations all over the United States (sorry Canada) many of the authors/bloggers from I Just Want To Pee Alone and other hysterical blogging friends are hosting a National Night Out. That's right. THE FIRST ANNUAL I JUST WANT TO PEE ALONE DAY, or what will be referred to from here on out as #FAIJWTPAD. A night where we're all drinking too much wine on the very same night. How is that different than last night, you ask? Well, for starters, we (probably) won't be in our pjs screeching at our children to go to bed. Don't live near your favorite blogger but want to get in on the fun? All the #FAIJWTPAD events are located on the I Just Want To Pee Alone Facebook page (<< that's a LINK!). Find the city nearest you, change out of your yoga pants, smear on a little lipstick and get ready to meet a lot of new friends! And don't be intimidated, you know you already have something huge in common with everyone else there (your great taste in books....and bloggers). And if there isn't one planned for a city near you, don't fret, because YOU can host one of your very own! Just pick a location and time for October 16. It doesn't need to be fancy, something casual tends to work best, anyway. Once you've got the details set, email Jen at sweetsadiecreations@gmail.com and she'll add your event to the page! So keep checking the events Facebook page, because new events are being added all the time. You all know that I don't have kids, but I posted on the FB wall that I have a husband and dog and frankly, I sometimes can't pee alone either. So, for all you NJ bloggers please come out and join the fun. Check out the FB invite for the NJ event! I will be there!!!!! Would love to see familiar faces and new ones! That's a fun idea! Too bad I have class Wednesday nights! I havent' met enough NJ-based bloggers, so I am really looking forward to this night out. Can't wait to meet you, thanks so much for sharing! 17 days and counting!